Mmmmm….. chocolate mousse! Thick, rich, sweet and creamy chocolate. Does it get any better? Probably not. As with any of our chocolate recipes, the better quality chocolate you use, the better the final product will be. Melt the chocolate in the top of a double boiler. Heat the water and sugar over low heat until sugar melts into a syrup. Add the sugar syrup to the chocolate and beat together. Beat the egg whites until they are stiff. Whip the cream until it forms firm peaks and fold it into the egg whites. Beat the chocolate again. If the chocolate has thickened, add 1 more tablespoon of water. Fold the chocolate into the cream/egg white mixture. Spoon into individual glasses or cups. The recipe calls for semi-sweet chocolate but you can use either semi-sweet or bittersweet chocolate. Obviously the bittersweet will be less sweet, even with the cup of sugar added. Suite your own taste. This recipe for mousse (not chocolate “moose”) sounds exotic but you can see from the directions that it is actually a fairly quick and easy dessert recipe. It is a wonderful recipe to serve company or for a romantic dinner, but easy enough to make any time. 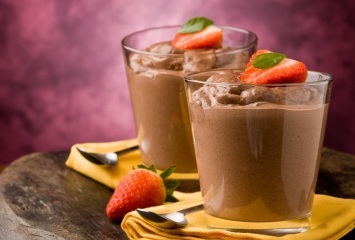 Chocolate mousse is just one of our delicious chocolate recipes. Find all of our easy dessert recipes here.